Mohammed, the prophet of Islam, died in 632, and under his successors, the Caliphs, the new religion created a vast empire through the Middle East and North Africa. Alexandra fell in 642, followed by Carthage in 699, and in 711 a raiding party crossed the straits into Spain. They were commanded by Tariq, who landed at an impressive rock which became named after him: “Jebel Tariq”, the Mountain of Tariq; or as we would say: Gibraltar. In less than five years Tariq’s little army, of only a few thousand warriors, had smashed the Visigothic kingdom which had ruled Spain ever since the collapse of the western Roman Empire, killed the king and captured the capital of Toledo. 30,000 prisoners are said to have been shipped out as slaves. The whole of Spain apart from a small northern strip was now under Moslem rule, and expansion continued into France until the Moslem advance was finally defeated by Charles Martel at the battle of Tours in 732. The Moorish rulers called their state “El Andalus”. It soon acquired a measure of independence because of events far away. In 661 the fourth Caliph, Ali, was murdered, and power was seized by Mu’awiya, who proclaimed himself Caliph and established his capital at Damascus, where his successors formed the Umayyad dynasty. Ever since then Islam has been divided, because Shia Moslems maintain that only Ali’s descendants can be the true Caliphs. In 749 a revolt against the Umayyads began in Iran and quickly spread, until the last Umayyad ruler, Marwan II, was cornered and killed in Egypt, and all his relatives except one were hunted down and slaughtered. A new ruling dynasty, the Abassids, was established, but their centre of power was in Iraq, where a new capital, Baghdad, was founded in 762. Spain now lay at the far distant end of the Islamic empire, and the last of the Umayyads, Abd al-Rahman, managed to escape and make his way there. Moorish Spain became an independent Emirate, and in 929, as the Abbasids declined, Abd al-Rahman III proclaimed himself to be Caliph. 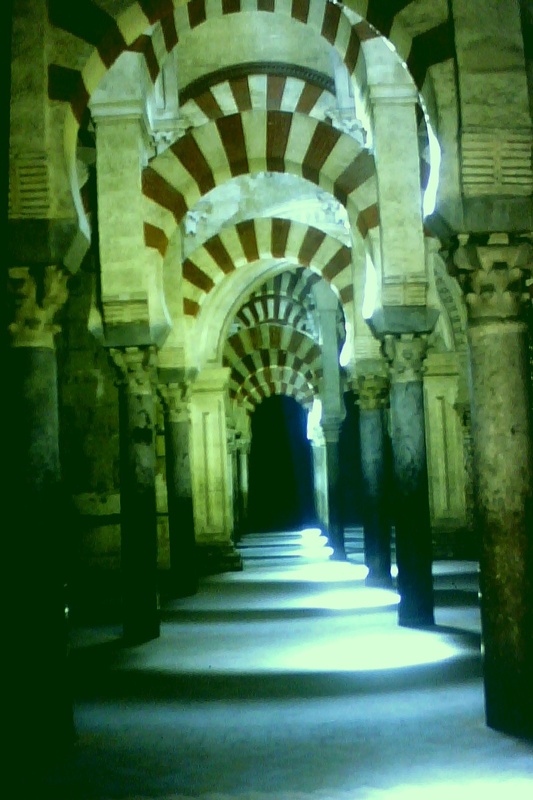 The capital of El Andalus was Cordoba, on the Guadalquivir river. 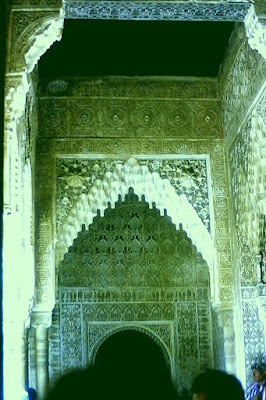 Here the Great Mosque was begun in 785, with additions and embellishments added in later centuries, notably an elaborate mihrab. 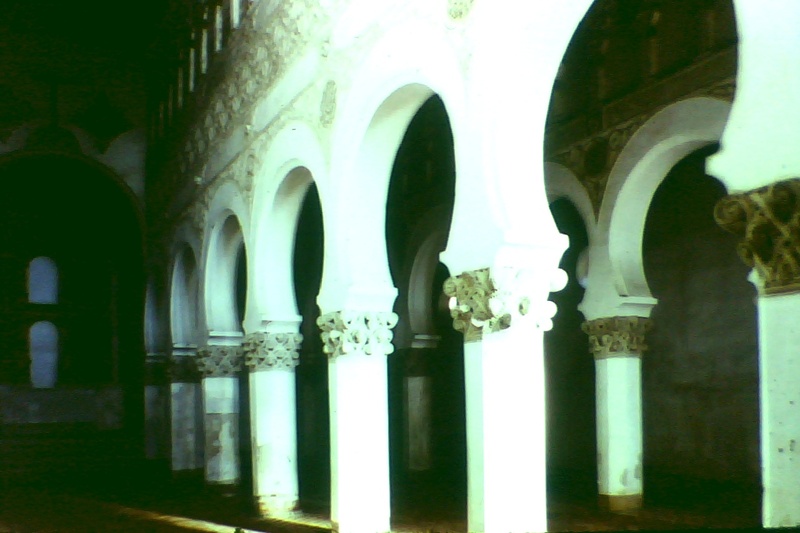 After the Reconquest, a cathedral was built in the heart of the reconsecrated mosque. The tragedy of this great civilization was that the formation and growth of small Christian kingdoms in the north of Spain in the 11th century: Leon, Navarre, Aragon, Castile and Barcelona; coincided with the disintegration of the Caliphate into a series of petty states. Al-Andalus was assisted, or invaded, by various new forces of militant Islamists from Morocco: Almoravids, Almohads (whose leader, Ibn Tumart, proclaimed himself the Mahdi) and later Marinids. Many of these groups were culturally primitive and had little sympathy with the glittering culture of Al-Andalus. Cordoba itself was sacked by Berber soldiers in 1032, and in 1085 Toledo fell to Christian forces. The famous warrior known as El Cid dates from this era. In fact his career was distinctly ambiguous in its loyalties, since he was prepared to fight for either side, and held Valencia as a fief of the Almoravids from 1094 till his death in 1099. Pope Eugenius II proclaimed a crusade in Spain. Would-be crusaders from north-western Europe found this a much easier focus for their activities than making the long and hazardous journey to Palestine; and in 1147 forces from England, Scotland, Normandy and Germany seized Lisbon, where the kingdom of Portugal was soon afterwards established. In 1212 King Alfonso VIII of Castile won a decisive victory at Los Navos de Tolosa, and this was followed over the next few years by the capture, one by one, of Cordoba, Valencia, Seville, the Balearics and the Algarve. 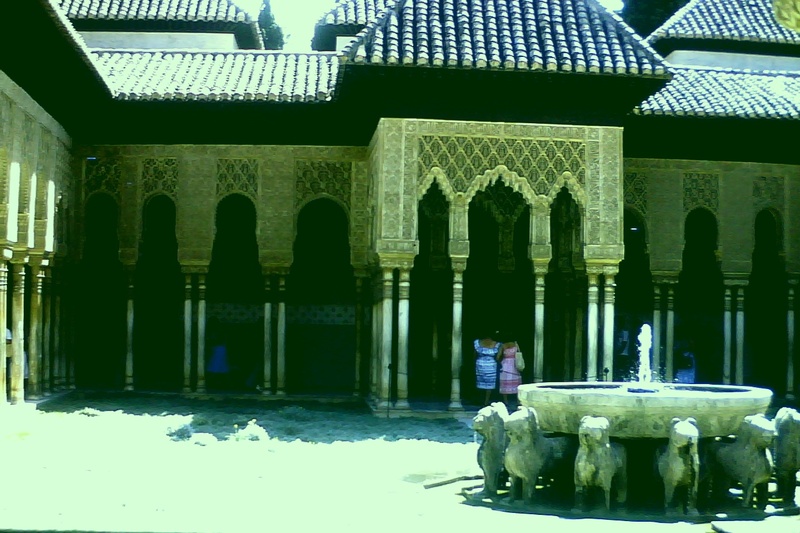 By the end of the 13th century, Moorish Spain was confined to a strip in the south-east, with its centre at Granada. That this enclave held out for the next two centuries must be attributed to rivalries and disputes between the different Christian kingdoms. Once Spain was united by the marriage of Ferdinand of Aragon and Isabella of Castile in 1479, Granada was doomed. Moorish Spain came to an end when Sultan Boabdil surrendered Granada in 1491. Ferdinand and Isabella entered the city in triumph in January 1492; which by coincidence was also the year when they decided to sponsor an Italian sailor named Christopher Columbus in his scheme to reach China by sailing across the Atlantic. The centuries of Moslem rule in Spain had profound consequences. It was estimated that there were about 300,000 former Moslems who were now officially baptised Christians, and the original purpose of the Spanish Inquisition was to investigate whether former Moslems and Jews were still secretly practising their old religious rituals. Also a very large number, even of the highest Spanish aristocracy, had Moslem or Jewish ancestors; and the hunt began for men of “pure blood”, without this contamination. Before long the decision was made to deport from Spain all Moslems and Jews, with disastrous effects on the Spanish economy. The most visible sign today of Moorish Spain is the architecture. This splendid building is a former synagogue in Toledo, dating from the 12th century, and is now known as Santa Maria la Blanca. Since there was no specifically Jewish architectural style, it was built on Arabic principles. There was a major massacre of Jews here in 1381. 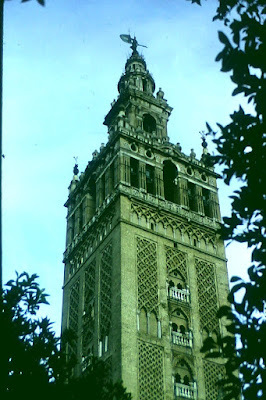 La Giralda in Seville: once the minaret of a great mosque and now the bell-tower of the cathedral. 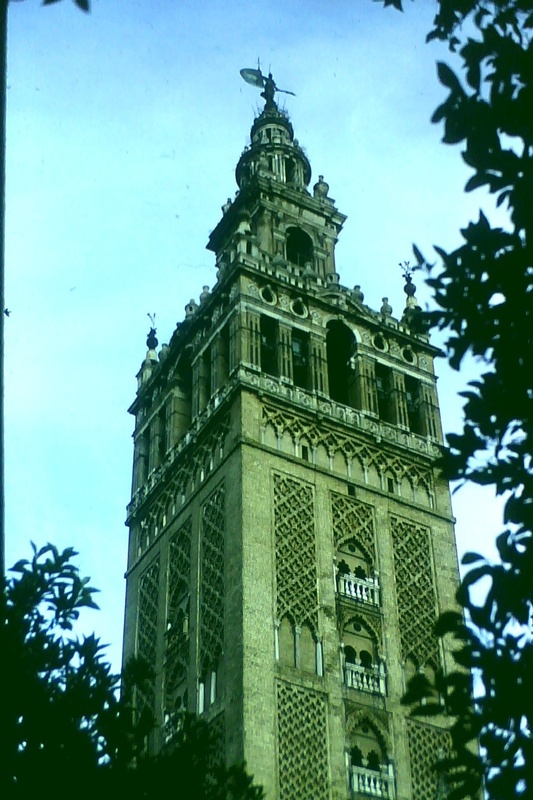 The lower part of the tower is Moorish, the upper part is 16th century Baroque. 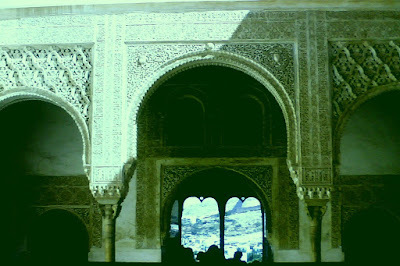 Finally, some pictures of the Alhambra of Granada, one of the most magnificent buildings in Europe, if not the world.